The entirely hand-woven, netted hammock chair is made by the finest craftsmen with our own braided cord. The luxurious bed is woven from a single length of rope within a sturdy, beautifully hand-finished hardwood frame. The rope is made from braided spun-polyester cord that has the softness and luxurious feel that cotton rope, used in the original Carolina hammocks over a century ago, still aspires to, yet seldom attains. The cord has the added advantage that it is much stronger, longer-lasting and more durable than cotton. The cord is available in natural beige and forest green. Each hammock chair has an attached footrest, which can be adjusted up or down quickly and easily while you're sitting! 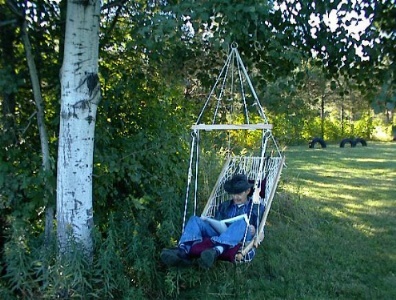 This unique, luxurious Hammock Chair delivers the most delightfully comfortable solution when you want the enjoyable sensation of one of our Deluxe hammocks, but in a smaller space, and in many more of your favorite spots in the garden, at the cottage, on the porch and even indoors. Installation: The hammock chair should be suspended from a solid support structure (e.g. a strong tree branch or a sturdy, well-supported beam). Always ensure that the hammock chair is securely attached and safely located, take care that the suspension cords are not twisted on the ring, and also make sure that the front and back of the chair are horizontal.